Of these, HB seems to have the most to be excited about with Mandatory Upgrades. With a Media Blitz, losing one of these can actually make a fast-advance strategy easier by providing you a tempo boost after a moment of weakness. 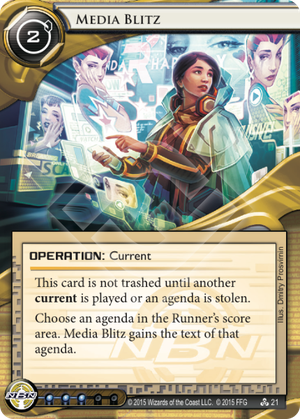 The Fragments also work well with Media Blitz as the one-per-deck restriction can now be worked around even if you lose this agenda early. Restructured Datapool could also provide an interesting way for tagstorm decks to consistently tax the runner, though not being able to combo the datapool with Surveillance Sweep is a significant drawback of this combo. I felt like this card needed a fresh review. So I did it. Lore-wise, this card is pretty simplistic. The runner stole our secret project, so we fake it 'til we make it and lead the public to believe everything is on its way to be released. And it works, somehow, because masses tend to be pretty gullible, be it real world or far future corpofascist dystopia. So, what would be worth blitzin' these days? Sadly, what we've seen above is not much in terms of really interesting effects. Advanced Concept Hopper and Puppet Master come to mind as pretty interesting counters to active runners, while Net Quarantine seems pretty sweet too in a deck that utilizes traces and wishes to punish the runner trying to meet their requirements. About as much can be said about Improved Tracers, though this feels just a bit weaker. Fragments do what Fragments did before, which might be useful - with Utopia Fragment you essentially get a more powerful Predictive Algorithm, while Hades Fragment gives you a kind of free Museum of History. Eden Fragment you mostly shouldn't consider. Unless you really like your glaciers, which you probably do. Self-Destruct Chips can give you that one brain damage you were short of for a successful kill, while Dedicated Neural Net, Encrypted Portals and Superior Cyberwalls boost your defenses. Gila Hands Arcology advertised with Media Blitz increases a little your efficiency in clicking for money, while Government Takeover allows you to make hecktons of cred - and you're going to need it as the opponent would like just one more point to win. Medical Breakthrough deserves a separate note - if you feel like doing some fast-advancing in Jinteki, that is. Media Blitz does not interact with Executive-type assets that were trashed and taken as agendas by a Runner - according to Lucas' own twitter, Director Haas won't give you a bonus click per turn and Chairman Hiro won't shrink your opponent's grip size as while in the score area they are both considered blank. Which is a tremendous shame, as that would make for an awesome combo. Which leads me to think that this game really needs some more interesting agendas that don't contain a self-referencing rules text. Fingers crossed for Red Sand! So much for crossing fingers. Only five agendas total from Red Sand, Kitara and Reign and Reverie are actually blitzable to a meaningful effect. Let's take a closer look, shall we? Water Monopoly - eh, why not run Scarcity of Resources instead? Escalate Vitriol - if you find yourself faced against a Runner who floats a lot of tags (or possibly the one you just landed a crapton of tags on! ), you might make a quick, clean buck out of a sudden, possibly even more than once. Sounds potent, although takes some setup to work - if it does, the payout might easily top Government Takeover. So, if your deck is already running these, including Media Blitz might help you in a tight spot. Otherwise you probably shouldn't bother. AR-Enhanced Security - Oh YEAH! Take THAT, you dirty Anarch! Having this one stolen is never a huge blow to your situation (one-pointers, ho!) and blitzing it is sure to hinder the Runner in a significiant way. Bonus points for doing this inside NBN: Controlling the Message for more taggy goodness (is there such a thing?). Better Citizen Program is more of a risky approach - two points less until endgame. Icebreakers aren't exactly played that often (exceptions being this dude and anybody using these bois), but there exists a niche of Runners who love their run events. Reliable in a deck that doesn't have that much stuff to trash, otherwise the one above might be the one you're looking for. I love the above two, mainly because of flavor (apparently there is no actual brainwashing or surveillance involved, but all the media coverage does feed the paranoia, doesn't it?). None of them really matter, however. Why? Remember Mandatory Upgrades? It rotated out, promptly shutting down the five minutes o'fame the Robocop archetype had. Good thing too, this thing was gloriously imbalanced. Well, R&R's got your back. Enter Jumon. It's not an additional click a turn, but, in its own right, turns out to be a very potent tool of mind games and fast advancement. If you try this in Tennin Institute: The Secrets Within, there's a good chance of sticking not two, but three advancements on a facedown card in a server per turn. The facedown card doesn't even have to be advanceable, so you could, for all we know, make the most threateningly-looking Melange Mining Corp. to ever grace a gaming table. Saraswati Mnemonics: Endless Exploration from the same pack might do a similar trick, giving you click compression for a price of little versatility. Somehow Tennin speaks out to me a little bit more, but if you value your fast-advance more than you do your glaciers, feel free to do so. I'm actually kind of surprised this isn't a thing yet.